When I was a kid there was an elbow in the downspout from the gutters of my neighbor’s roof less than 10 feet from my bedroom window and for many years robins made a nest in this well protected spot. I loved watching those birds build and repair the nest, lay their eggs, hatch and feed the tiny, naked young birds until they were way too big to fit into the nest. Sometimes there were broken shells in the nest but no birds. Sometimes there were dead adult birds lying on the sidewalk as if they had just fallen in their sleep out of the old oak trees of my neighborhood. Sometimes my friends and I would follow the trucks that had giant fogging sprayers. We liked to see them blast the trees all the way to the top canopy and play in the fall out mist. The sprayers were mounted on the back of the truck with a gunner seated on an articulated platform that could control the intensity of the spray and swivel almost full circle. He could also move it up and down like some giant anti-aircraft gun as he decided which tree he would attack next as the truck slowly and methodically rumbled down the street. I never questioned any of this except why were they spraying the trees so late in the night? And little did I know how accurate my little boy guns and warfare analogy of the sprayer truck to military weaponry was, as it was designed for the efficient administration of the unannounced techno-chemical war that had been privately declared on nature in the mid 20th century. Fast forward 10 or 12 years to when I am dating a beautiful girl of Japanese descent. Her mother, who was one of the earliest prototypes of the driven career woman, hands me her first edition copy of Silent Spring, which had been published several years earlier. I had no idea what it was about, but she assured me that I would like it and that it was a gift. Since I wanted to keep dating her daughter, I figured I better read it so I wouldn’t appear stupid in case she asked me about it. So can a book change your life? Did this one? Yes to both questions. As I learned in Silent Spring, those pesticide trucks had been incredibly effective in decimating avian populations all over the country. Of course birds were not the primary targets, it was mosquitoes they were after. The birds were only collateral damage from friendly fire. We had won World War II and had now brought the war home to conquer nature for once and for all time. We could accomplish anything we wanted. I guess this was the military/industrial complex that Eisenhower had warned us about. We began manufacturing chemicals with names no one could pronounce so we gave them alpha-numeric abbreviations like 2,4-D, PCB and DDT. Various formulations of DDT is what those trucks were spraying and fortunately Rachel Carson discovered in the nick of time that DDT is an endocrine interrupter that travels up the food chain in ever higher concentrations. The eggshells of birds everywhere became thin and broke before hatching and reproduction rates plummeted. Our national bird, the bald eagle, being a top predator was in danger of extinction due to the amount of the pesticide it ingested from the tissue of its prey. 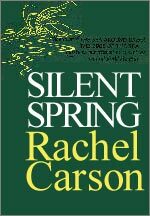 As a reward for sounding the alarm, Rachel Carson was vilified and hounded by the chemical industry for her research and her book. The legacy of this book is that we should be ever vigilant of these contaminants and poisons and we should protect ourselves, and the environment from future harm. DDT was banned in 1972. Bird populations have been recovering everywhere ever since. It is incomprehensible to me that today there are people in the United States who are calling for the return of DDT and other banned pesticides, not only for use in third world countries but here in the U.S.